Is everything we feel simply a state of our unconscious mind? Is loneliness then just another human condition? If this is true, is there still a way that we can overcome the feelings of lonesomeness? Loneliness as we know tunnels its way around our physical body, making us feel uncomfortable, all the while our Ego has latched on to make matters worse. The many symptoms of feeling alone can be excruciating painful. But anything that we experience that is painfully difficult is always for our higher good, and the benefit of our Soul. All of what we feel on a deep Spiritual level is allowing us the space to grow and evolve. Sensitive Intuitive people have a very hard time finding others that will understand them, this is a fact. If your expectation in this life is to find people who ‘get you’, you will be gravely disappointed. At best you may find one or two others that come as part of your soul family to ease the growing pains. Perhaps one person may become a mentor, another a trusted friend or there will be someone with a similar path as yours, that you can trust. The very best you can ever do with your state of loneliness is peacefully surrender to it, because what it will gift to you over time is a deeper understanding of yourself. Following the path of our Soul and as we embark upon our life’s journey, we might ask ourself ‘what is it I am striving for, is it to achieve a greater understanding of what it is I want the most for my life? Trust then when you discover what it is, find the courage to act on it, then live it, and you will never be lonely again. Your happiness depends on you. 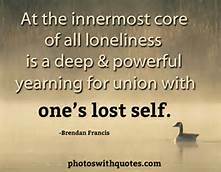 Being lonely can quite possibly be something positive to experience if we are brave enough to confront our habitual and repetitive responses to our Egos negative voice. If we are continually distracting ourselves with the reassurance of others, we won’t allow ourselves the space to move with the flow of what we are feeling inside. Buddha taught that we must cease to yearn for happiness outside ourselves and begin to trust the potential for the nirvana that lies within us. The way out of loneliness is to connecting to loving ourselves more deeply, this is what we consider going beyond the ego. Do not be afraid of the loneliness that you might experience at any given time. Allow it to awaken you from the place of where you have been unconsciously asleep. The state of aloneness is part of the process of your Souls growth, so trust it, lovingly embrace it, and perhaps enjoy the seclusion, for it has a lot to teach you not only about yourself but about the world as well, if you think about it.